I'm not dead! Just trying to adjust to the new job and such, experiencing a bit of writers block. More on that later. I'm making my return just in time to tell you that I love La Bella Figura and why you should attend their event in Chicago this Wednesday. Full disclosure, I am friends with Karen, one of the owners, but so what? If they weren't creating fabulous chemical free skincare products right here in Chicago, I wouldn't write about it. And if it weren't for Karen, I NEVER would have started gloriously smearing oil on my acne prone skin everyday. I have been using La Bella Figura's Tesoro for months and I love it. I started using Tesoro at the end of winter when my skin was crazy dry. Nothing seemed to work for it (even Dr. Hauschka's Quince Day Cream) and most moisturizers irritated my skin, until Tesoro. I stopped having my skin embarrassingly flake off in the middle of the day AND it transitioned into summer perfectly. It may be oil, but despite my trepidation, you just need a few drops, it dries light, and the 1 oz bottle lasts much longer than my drug store moisturizer. No unusual breakouts, and I swear it smoothed out a few lines around my eyes and makes my massive pores look smaller. Plus it smells great and not too hippy-like, which is a big deal to me. I can't stand the smell of hippy that can often be associated with green beauty products. I can also recommend their Découverte under eye repair serum, which nixes dark circles after a night out! I use it and Tesoro at least daily. Karen and Victoria, the ladies at LBF, took a cue from the Europeans and have been creating a chemical free skincare line using natural, wild-crafted, and organic ingredients from sustainable and fair sources. Check out all their products and more info on their website. 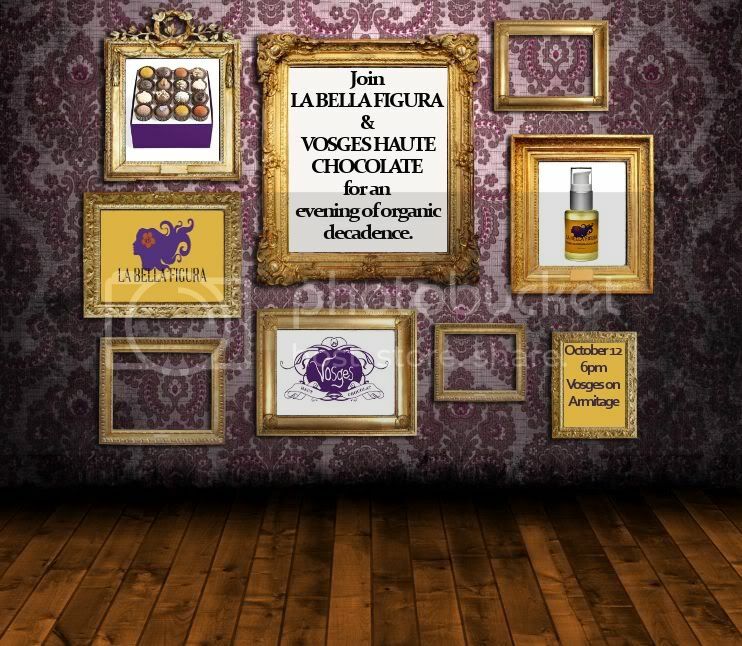 Even better, if you're in Chicago and you like wine and chocolate (and if you don't you might not be human), come to Vosges Haut Chocolat Boutique this Wednesday, October 12 from 6-9 p.m. Join the ladies from La Bella Figura for a night of decadence where you can sample their product, try Vosges heavenly chocolates AND have a glass of biodynamic vino all for free. You're basically losing money if you don't go. I'm not one to wave my green flag, but I really do love LBF and it's an added bonus that they make products that are good for you, sustainable, and are genius enough to pair up with a chocolatier for an event. See you there!